We characterized vaccine-induced cellular responses to rabies virus in naive adult volunteers. Contrary to current paradigms, we observed potent and prolonged in vitro NK cell cytokine production and degranulation responses after restimulation of PBMCs with inactivated rabies virus in vaccinated, but not in unvaccinated, individuals. This “recall” NK cell response was absolutely dependent on Ag-specific IL-2 from CD45RO+ CD4+ T cells as well as IL-12 and IL-18 from accessory cells. Importantly, NK cells represented over 70% of all IFN-γ–secreting and degranulating cells in the first 12–18 h after virus rechallenge indicating they may be required for rapid control of infection after vaccination. Activation of NK cells may be a critical function of IL-2–secreting effector memory T cells. Although IL-2–dependent postvaccination NK cell activation has been reported previously, this is the first time the magnitude of this effect and its contribution to the overall vaccine-induced response has been appreciated and the mechanisms of NK activation postvaccination have been elucidated. Our data will allow standard protocols for evaluating vaccine-induced immunity to be adapted to assess NK cell effector responses. The innate immune system is designed to provide rapid but generic responses to foreign organisms. Conversely, adaptive responses are slow (requiring clonal expansion of naive precursors to generate sufficiently large populations of effector and memory cells) but highly specific. Bidirectional interactions between innate and adaptive immune systems are essential for immunity to infection and for successful vaccination. Innate effector cells amplify and direct the subsequent adaptive response (1–3), whereas effector T cells activate innate cells to kill pathogens or pathogen-infected cells (4). NK cells are innate immune effectors that, by cytokine production or cytotoxicity, help to contain an infection until an effective adaptive response is mounted. NK cells become activated when the balance of activating and inhibitory signals that they receive is disturbed (5). Direct NK cell activation follows interaction with cells that (due to mutation or infection) lack ligands for inhibitory NK cell surface receptors for self-MHC (the “missing-self” phenomenon) and/or express stress-induced ligands for NK cell-activating receptors. 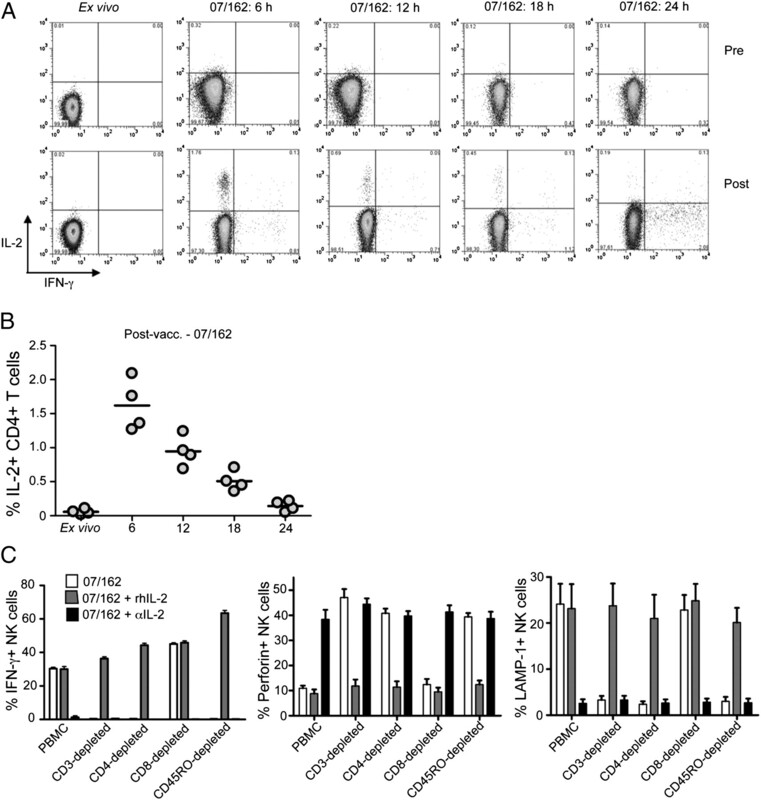 Indirect NK cell activation occurs after microbial ligation of pattern recognition receptors on myeloid accessory cells and is mediated by cytokines (IL-12, IL-18, and IFN-α) and by contact-dependent stimuli from myeloid cells (e.g., ICAM-1/LFA-1) (6). Our investigations of the pathways of NK cell activation by Plasmodium falciparum (malaria)-infected RBCs revealed essential roles for IL-12 and accessory cell contact as well as subsidiary roles for IL-18 and IFN-α (7–9). However, optimal NK cell responses to malaria-infected cells were also dependent on IL-2 (7) and although myeloid cells were essential (7), we were never able to fully recapitulate the NK cell response of mixed PBMCs by addition of myeloid cells (plastic adherent monocytes, macrophages, and dendritic cells) to purified NK cells (A. Horowitz, unpublished data). These observations (A. Horowitz, unpublished data), bolstered by reports of T cell and IL-2–dependent activation of human NK cells (8, 9) and of an increase in the frequency of IFN-γ–producing NK cells among restimulated PBMCs after influenza vaccination (10) led us to speculate that IL-2 from Ag-specific T cells might allow NK cells to contribute to the effector arm of adaptive immune responses and thus NK cells may make a significant contribution to the cellular effector response to vaccination. In this study, we tested the hypothesis that NK cell responses are specifically enhanced, after vaccination, by IL-2 emanating from Ag-specific T cells. Using rabies virus vaccination as our model system (as inapparent exposure to rabies virus is likely to be extremely rare and our volunteers are thus expected to be fully naive prior to vaccination), we demonstrate that NK cells are the major contributors to the immediate vaccine-specific cytokine and cytotoxic recall response, that this response is dependent on IL-2 from Ag-specific memory T cells and is associated with extensive NK cell proliferation. We conclude that NK cells represent an important, and underappreciated, component of the adaptive immune response; that activation of NK cells may be a critical function of IL-2 secreting effector memory T cells; and that protocols for evaluation of vaccine-induced immune responses need to include assessment of NK cell activation as well as T cell IL-2 secretion. Thirty healthy adult volunteers (median age = 28 y; intraquartile range = 26–31 y) received three doses (days 0, 7, and 21) of 2.5 IU heat-inactivated rabies virus (Flury LEP strain) (RABIPUR, Novartis vaccines) by i.m. injection. All subjects gave fully informed, written consent, and the study was approved by the London School of Hygiene and Tropical Medicine Ethics Committee. PBMC collected immediately before the first and third vaccinations (i.e., day 0, day 21) were cryopreserved in liquid nitrogen so that pre- and postvaccination samples could be analyzed side-by-side at the end of the study. PBMCs (2 × 106 cells/ml) were cultured in 96-well U-bottom plates for up to 7 d (with or without 25 ng/ml PMA plus 1 μg/ml ionomycin [both Sigma-Aldrich, St. Louis, MO] [P/I], rhIL-12, rhIL-18, or rhIL-2 [0.1 μg/ml] or 200 arbitrary units/ml inactivated rabies virus 07/162 [5th International Standard; National Institute for Biological Standards and Control, Potters Bar, U.K.]). Neutralizing anti–IL-2 (MQ1-17H12; BD Biosciences, San Jose, CA), or anti–IL-12 and anti–IL-18 (R&D Systems, Minneapolis, MN) were each used at final concentrations of 10 μg/ml. Recombinant rabies virus nucleocapsid protein (rNCP) (M. Juozapaitis, Institute of Biotechnology, Vilnius, Lithuania) was used at a final concentration of 10 μg/ml. Brefeldin A (3 μg/ml) and monensin (1.33 μg/ml) were added to all cultures for the last 5 h of the culture. CD3+ cells were positively selected using FlowComp human CD3 Dynabeads and a Dynal Magnetic Particle Concentrator-2 (both Invitrogen, Carlsbad, CA), according to the manufacturer’s instructions and purity confirmed with anti-human CD3 Ab (clone UCHT-1; BD Biosciences). Purity of both CD3+ and CD3− cell populations was >97%. T cell subsets were depleted on LD separation columns (Miltenyi Biotec, Auburn, CA) using mAbs to CD4 (BD Biosciences) or CD8 (Caltag Laboratories, Burlingame, CA) or anti-CD45RO–coated microbeads (Miltenyi Biotec). PBMCs labeled with 10 μM CFSE (Invitrogen) were cultured at 37°C with 5% CO2 for up to 7 d with or without rabies virus 07/162 and analyzed by flow cytometry. Surface and intracellular staining was performed as previously described previously (11). Abs used were as follows: CD56 PE (N901), CD56 APC (N901) (both Beckman Coulter, Fullerton, CA), CD56 PE-Cy7 (B159), CD45RO PE-Cy7 (UCHL1), CD3-PerCP (SK7), CD4 APC-Cy7 (RPA-T4), CD4 PE (RPA-T4),CD8 PE (SK1), LAMP-1 biotin (H4A3), Perforin PE (δG9), IL-2 APC (MQ1-17H12), streptavidin-PerCP (all BD Biosciences), anti-CD69 PE (CH/4), and CD3 PE-Texas Red (S4.1) (both Caltag/Invitrogen), CD8 Pacific Blue (LT8; eBiosciences, San Diego, CA) and IFN-γ FITC (D9D10; Ab Serotec). Data analyses were performed using prism5 (GraphPad, San Diego, CA) or Stata10 (StataCorp, College Station, TX). To estimate the proportion of the precursor lymphocyte population proliferating through each division, the number of CFSE-diluted cells in each division was divided by 2(number of divisions + 0.5) (12). PBMCs isolated from vaccinees immediately before their first and third vaccinations (day 0 and day 21) were cultured for 21 h without stimulation (growth medium [GM]), with P/I (positive control) or with inactivated rabies virus (07/162) as the specific recall Ag. Cell surface expression of CD69 and intracellular expression of IFN-γ were analyzed in CD3+ CD4+ and CD3+ CD8+ T cells and in CD56+ CD3− NK cells (Fig. 1A). A representative example of IFN-γ and CD69 expression before (left panels) or after (right panels) two doses of rabies vaccine is shown in Fig. 1B, and data from five individual vaccinees are shown in Fig. 1C and 1D. In the prevaccination samples, P/I induced upregulation of both IFN-γ and CD69 in CD4+ and CD8+ T cells and in NK cells but none of these cells responded to rabies virus 07/162. By contrast, in the postvaccination (day 21) samples, rabies virus 07/162 induces highly significant upregulation of IFN-γ and CD69 in CD4+ and CD8+ T cells and in NK cells. Moreover, among NK cells the IFN-γ responses are as high as those induced by the polyclonal stimulator P/I (with at least 30% of all NK cells staining positively for IFN-γ) and the mean fluorescence intensity (MFI) for IFN-γ staining is significantly higher among NK cells than among T cells (Fig. 1B, 1D). Both CD56bright and CD56dim NK cells produce IFN-γ in response to rabies virus 07/162 (data not shown) and although a higher percentage of CD56bright NK cells than CD56dim cells make IFN-γ (∼50 versus ∼20%), because CD56bright cells make up only a small proportion of the NK cell population, the majority (>75%) of the IFN-γ+ NK cells are in fact CD56dim. After rabies vaccination, T cells and NK cells upregulate CD69 and produce IFN-γ in response to rabies virus. PBMCs were isolated before (pre) and after (post) two doses of rabies vaccine, cultured in vitro for 21 h in GM alone (GM) or with PMA and Ionomycin (P/I) or heat-inactivated rabies virus (07/162) and analyzed by flow cytometry for surface expression of CD69 and intracellular IFN-γ. A, Lymphocytes (identified by characteristic forward light scatter and side light scatter) were identified as NK cells (CD56+ CD3−), CD4+ CD3+ T cells, or CD8+CD3+ T cells. B, Representative flow cytometry plots for PBMCs obtained before or after rabies vaccination from one donor, showing IFN-γ and CD69 expression in CD4+ T cells, CD8+ T cells, and NK cells after restimulation in vitro with rabies virus 07/162. C, Percentages of IFN-γ+ cells (left plots) and MFI of CD69 expression (right plots) among CD4+ T cells, CD8+ T cells, and NK cells isolated from five subjects, before (open circles) and after (filled circles) vaccination, and restimulated in vitro. D, MFI of IFN-γ+ CD4+ T cells, CD8+ T cells, and NK cells among postvaccination PBMCs from five subjects cultured with (07/162; filled circles) or without (GM; open circles) inactivated rabies virus). The p values are derived from two-tailed paired Wilcoxon test. Having found that vaccination primes NK cells to make a robust and immediate IFN-γ recall response to vaccine Ag, we sought to determine how quickly this NK response develops and for how long it is sustained, by sampling cultured PBMCs at intervals over a 7-d period (Fig. 2). Restimulation of postvaccination PBMCs with rabies virus 07/162 leads to an initial, modest peak in IFN-γ production from both CD4+ and CD8+ T cells at 18–24 h, but there is a second much more robust response that begins on day 5 and which is still increasing on day 7 (Fig. 2A). By contrast, a very robust NK cell recall response is clearly underway within 12 h and peaks at 18 h; however, there was also a second wave of NK cell IFN-γ production, coinciding with the secondary wave of the T cell response, such that ∼30% of NK cells were still making IFN-γ 7 d into the recall response. This biphasic NK cell and T cell response may reflect an initial responding population giving rise to a second generation of responsive cells or providing essential stimuli for further cell activation. In either case, it is apparent that NK cells are not only the earliest contributors of IFN-γ to the postvaccination recall response but also contribute to this response for a protracted period. Postvaccination, NK cells make both early and sustained IFN-γ responses to vaccine Ags. PBMCs from five subjects were isolated before (pre) and after (post) two doses of rabies vaccine, analyzed immediately (ex vivo) or cultured in vitro for up to 7 d in GM alone (GM) or with heat-inactivated rabies virus (07/162) and analyzed by flow cytometry for intracellular IFN-γ. A, The percentage of IFN-γ+ CD4+ T cells, CD8+ T cells, and NK cells detected in PBMC cultures at each time point. The vertical dashed line separates data from a short-term restimulation (up to 18 h) and a long-term restimulation experiment. 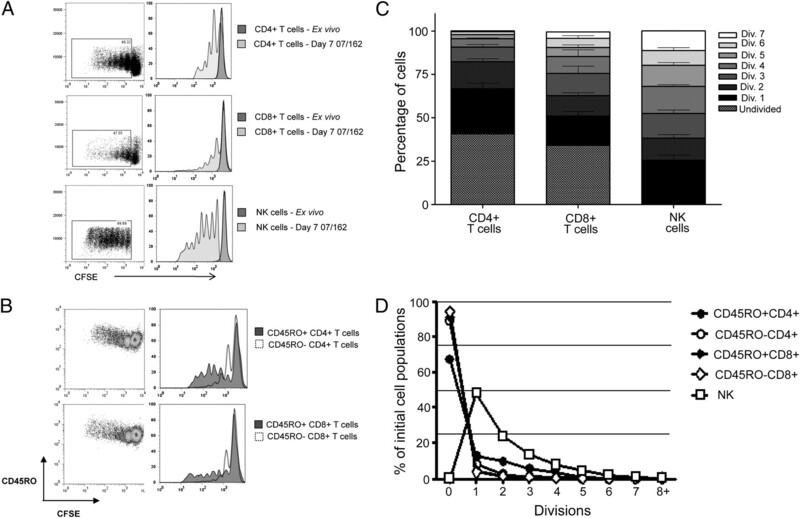 B, The absolute number of IFN-γ+ lymphocytes was calculated at each time point and stratified according to whether these were NK cells or CD4+, CD8+, or CD4−CD8− T cells. Numbers above each column indicate the proportion of all the IFN-γ+ cells that are NK cells (mean ± SE). 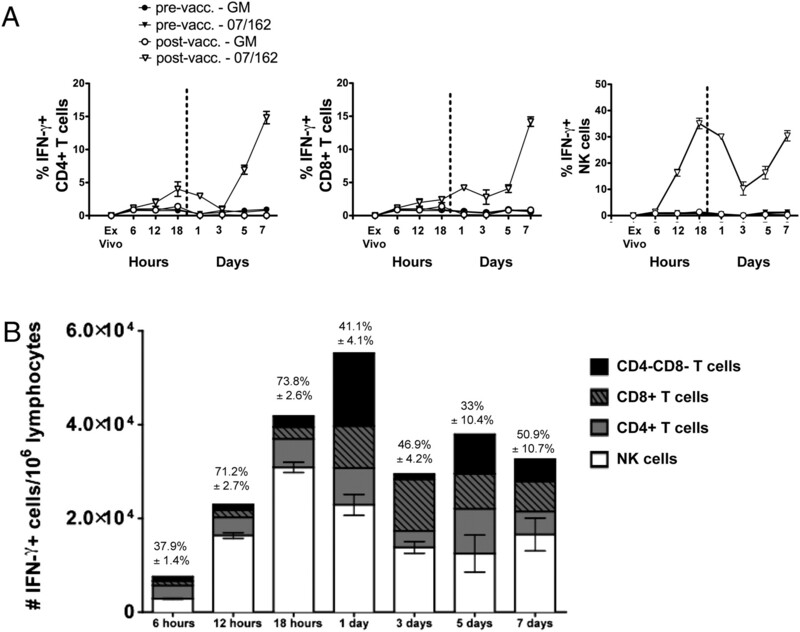 Although the proportion of NK cells producing IFN-γ in the restimulated postvaccination samples was much higher than the proportion of T cells producing IFN-γ, circulating T cells outnumber NK cells by ∼10:1. We therefore calculated the contribution of NK cells to the total pool of IFN-γ–producing cells (Fig. 2B). Twelve and 18 h after in vitro restimulation with rabies virus 07/162, >70% of all IFN-γ+ cells were NK cells. Although this dropped to ∼40% by 24 h, NK cells continued to represent 30–50% of all IFN-γ+ cells until at least 7 d after restimulation. Thus, not only are NK cells readily activated postvaccination, but they contribute very significantly to the total effector cell pool during the first 7 d of the recall response. When taken together with the very high MFI for IFN-γ staining among NK cells (Fig. 1) these data suggest that the overwhelming majority of the early IFN-γ emanates from NK cells. One of the hallmarks of NK cells is their ability to rapidly detect and kill (within minutes) infected, transformed, or nonself cells by releasing preformed cytolytic molecules, such as perforin and granzymes, stored in secretory granules. Although CD8+ T cells kill in a similar manner, their stores of cytolytic granules are very limited and CD8+ T cells thus need time, after reactivation, to synthesize cytolytic granules and become fully cytotoxic (13). To determine whether NK cytotoxic responses are enhanced postvaccination and whether NK cells might thus represent the first wave of actively cytotoxic cells during the recall response, we cultured pre- and postvaccination PBMCs with P/I or rabies virus 07/162 and measured surface expression of CD107a/LAMP-1 (as an indicator of degranulation) and intracellular levels of perforin. Representative flow cytometry plots for CD107a/LAMP-1 and perforin staining of CD8+ T cells and NK cells from pre- and postvaccination PBMCs are shown in Fig. 3; data from five individual vaccinees are shown in Fig. 4A. As expected, resting (GM) NK cells do not express surface CD107a/LAMP-1 but resting CD56dim (but not CD56bright) NK cells do contain preformed perforin; 12 h polyclonal (P/I) stimulation results in increased surface expression of LAMP-1 and complete loss of intracellular perforin, consistent with NK cell degranulation. In contrast, resting CD8+ T cells do not contain perforin but do synthesize perforin and upregulate LAMP-1 in response to P/I stimulation. Importantly, stimulation with rabies virus 07/162 also causes marked degranulation (upregulation of LAMP-1 and loss of perforin) of CD56dim NK cells in the postvaccination but not in the prevaccination samples. Degranulation in 07/162-restimulated postvaccination CD8+ T cells is less marked, but there is clear induction of perforin synthesis. Representative staining of LAMP-1 and perforin expression in CD8+ T cells and NK cells. Representative flow cytometry plots showing CD8+ T cell expression of LAMP-1 and perforin (upper panels) and LAMP-1 (middle panels) and perforin (lower panels) expression in NK cells isolated from one donor data before and after rabies vaccination (ex vivo) and after culture in vitro in GM (GM) or with rabies virus 07/162 for 12 h. Isotype matched control Abs (mIgG2b or mIgG1; left panels) were used to establish background levels of staining. Postvaccination, NK cells degranulate and release perforin in response to rabies virus. PBMCs were isolated from five subjects before (pre) and after (post) two doses of rabies vaccine, analyzed immediately (ex vivo) or cultured in vitro for up to 72 h in GM alone (GM) or with PMA and ionomycin (P/I) or heat-inactivated rabies virus (07/162) and analyzed by flow cytometry for surface expression of LAMP-1 and intracellular perforin. 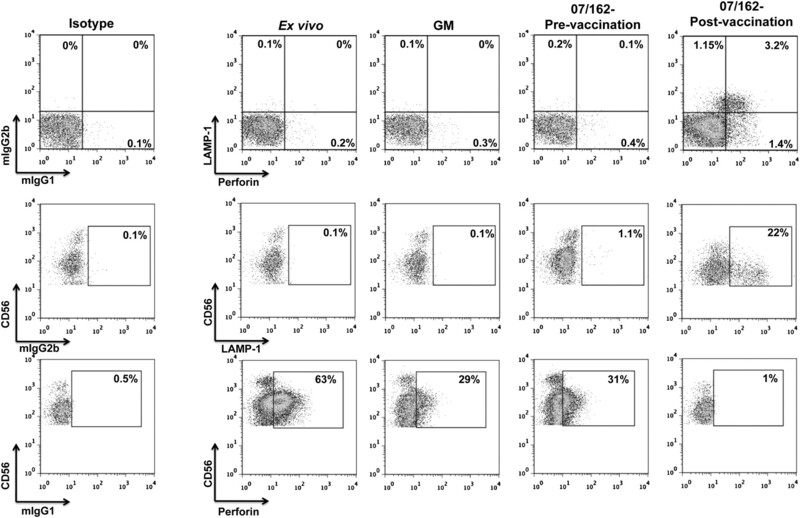 A, Percentages of LAMP-1+ (left plots) and perforin+ (right plots) NK cells (upper plots) and CD8+ T cells (lower plots) isolated before (open circles) and after (filled circles) vaccination, and restimulated in vitro for 12 h. Data represent mean ± SE. The p values are derived from two-tailed paired Wilcoxon test. B, The percentages of LAMP-1+ (left plots) and perforin+ (right plots) NK cells (upper plots) and CD8+ T cells (lower plots) detected in PBMC cultures at each time point. C, Pie charts showing the proportion of all LAMP-1 (top row) expressing lymphocytes and all perforin (bottom row) expressing lymphocytes that are either NK cells (light gray) or CD8+ T cells (black) among postvaccinated PBMCs stimulated in vitro for up to 72 h with rabies virus 07/162. The size of the circles is proportional to the absolute numbers of LAMP-1+ or perforin+ cells per 106 PBMC. Data represent mean values from five subjects. To determine whether NK cells or CD8+ T cells were the major contributors to the early cytotoxic response we analyzed the degranulation response of the two cell populations over time (up to 72 h) (Fig. 4B) and calculated the absolute number of degranulating cells that were either NK cells or CD8+ T cells at each time point (Fig. 4C). There was rapid (within 6 h) and sustained (at least 72 h) upregulation of surface LAMP-1 expression in rabies virus restimulated, postvaccination, NK cells and CD8+ T cells. In NK cells, LAMP-1 upregulation was evident by 6 h, peaked (at >25% of all NK cells) at 12 h and then gradually declined, whereas in CD8+ T cells, LAMP-1 expression was maximal by 6 h (at ∼4% of all CD8+ T cells) and was sustained at this level for the duration of the experiment. The kinetics of the perforin response in postvaccination NK cells mirrored the LAMP-1 response, with the proportion of perforin+ cells falling significantly within 6 h and reaching its lowest point at 12 h, indicating perforin release by degranulation in postvaccination NK cells within 6 h of re-exposure to the vaccine Ag. However, perforin took up to 12 h to accumulate in restimulated postvaccination CD8+ T cells suggesting that the 6 h burst of T cell degranulation may not lead to an optimal cytotoxic response. The degranulation response was Ag-specific because LAMP-1 expression remained at baseline levels in all unstimulated cells and in rabies virus restimulated prevaccination NK and CD8+ T cells. Perforin levels remained at baseline in unstimulated and prevaccination CD8+ T cells. There was a gradual loss of perforin over time in prevaccination NK cells and in unstimulated postvaccination NK cells, presumably reflecting nonspecific leakage of perforin. The relative contributions of NK cells and CD8+ T cells to the pool of cytotoxic effectors are shown in Fig. 4C. NK cells represent the majority of both LAMP-1+ and perforin+ cells 6 h after Ag stimulation. The marked decrease at 12 h in the proportion of perforin+ cells that are NK cells, together with the increased proportion of the LAMP-1+ cells that are NK cells, provides further evidence of a wave of NK cell degranulation between 6 and 12 h. In contrast, although CD8+ T cells represent the majority of all perforin+ cells from 12 h onward, they do not represent the majority of degranulating, LAMP-1+ cells, until 48–72 h into the recall response. Our previous data (7) and that of others (9) indicating a role for IL-2 and CD4+ T cells in NK cell activation, led us to speculate that IL-2 from Ag-specific T cells drives the recall response of NK cells after vaccination. We therefore analyzed the kinetics of IL-2 and IFN-γ production by CD4+ T cells among pre- and postvaccination PBMCs restimulated in vitro with rabies virus 07/162 for up to 24 h. Representative flow cytometry plots for one vaccinated subject are shown in Fig. 5A and postvaccination data from four subjects are summarized in Fig. 5B. Ag-specific IL-2 production from CD45RO+ CD4+ T cells is required for NK cell recall responses. Pre- and postvaccination PBMCs from four subjects were cultured for periods of up to 24 h without stimulation (GM) or with rabies virus (07/162) and analyzed by flow cytometry for intracellular IL-2 and IFN-γ. A, Representative flow cytometry plots showing IL-2 and IFN-γ expression in pre- (upper plots) and post- (lower plots) vaccination CD4+ T cells from one donor in response to 07/162 stimulation over 24 h. B, Percentages of CD4+ T cells expressing intracellular IL-2 in response to 07/162 restimulation over time; postvaccination samples from four subjects. C, Postvaccination PBMCs from four subjects were cultured for 12 h (perforin and LAMP-1 expression) or 24 h (IFN-γ expression) with rabies virus 07/162 in the presence or absence of rhIL-2 or a neutralizing Ab to IL-2 and analyzed for intracellular IFN-γ (left panel), intracellular perforin (middle panel), or cell surface expression of LAMP-1 (right panel). Parallel experiments were carried out using PBMCs that had been depleted of all CD3+ T cells, just CD4+ T cells, just CD8+ T cells, or just CD45RO+CD3+ T cells. Data represent mean ± SE. Statistical analysis is presented in Supplementary Table I.
Prevaccination, CD4+ T cells produce neither IL-2 nor IFN-γ in response to rabies virus 01/162. Postvaccination, a clear population of IL-2+ CD4+ T cells can be distinguished, peaking as early as 6 h after re-exposure to rabies virus and declining to negligible values within 24 h. Very few of the IL-2+ cells produced IFN-γ (Fig. 5A) suggesting that at this early stage they are Th0 rather than Th1 effector cells. In line with our hypothesis, the peak of T cell IL-2 production (6 h) preceded the onset of NK cell IFN-γ production (12 h; Fig. 2A). To determine whether this CD4+ T cell IL-2 response contributed to the postvaccination NK cell response, postvaccination PBMCs from five subjects were cultured overnight with rabies virus 07/162 in the presence or absence of rhIL-2 or a neutralizing Ab to IL-2 and analyzed for intracellular IFN-γ, intracellular perforin or cell surface expression of LAMP-1 (Fig. 5C; statistical analysis is shown in Supplemental Table I). In parallel experiments, PBMCs were depleted of all CD3+ T cells, just CD4+ T cells, just CD8+ T cells or just CD45RO+CD3+ T cells. In the intact PBMC cultures, as before, there were potent NK cell IFN-γ and degranulation (decreased intracellular perforin and increased surface expression of LAMP-1) responses to the recall Ag. Anti–IL-2 Ab completely ablated both the IFN-γ response and degranulation. Moreover, NK cells among PBMCs depleted of CD3+, CD4+, or CD45RO+CD3+ T cells did not mount any significant IFN-γ or degranulation responses; depletion of CD8+ T cells, in contrast, had no significant detrimental effect on the NK cell recall response. In support of our hypothesis, however, NK cells among CD4+ T cell-depleted and CD45RO+ T cell-depleted PBMCs were able to make robust IFN-γ and degranulation responses when cultures were supplemented with rhIL-2. To determine whether IL-2 produced by T cells during the postvaccination recall response induced NK cell proliferation, which might potentiate the NK cell effector response and/or replenish the NK cell pool after activation-induced cell death of the first wave of the effector response, we labeled pre- and postvaccination PBMCs from four donors with CFSE, cultured them for 7 d without stimulation (GM) or with rabies virus 07/162, and then analyzed CFSE expression separately in CD4+ T cells, CD8+ T cells and NK cells (Fig. 6A) and in both CD45RO+ and CD45RO− populations of T cells (Fig. 6B). Cells cultured without Ag did not proliferate (data not shown). Extensive proliferation was observed in postvaccination T cells and NK cells after 7 d restimulation with the recall Ag, rabies virus 07/162. The CFSE dilution patterns (Fig. 6A) suggested that a higher proportion of NK cells than T cells were proliferating and that NK cells were going through more rounds of proliferation than the T cells. Indeed, we were unable to see any undivided NK cells and we could discern at least seven distinct CFSE peaks among the NK cells, whereas a substantial proportion of T cells remained undivided and only approximately four peaks of divided cells could be seen; this was confirmed by detailed analysis of samples from four vaccinees (Figs. 6C, 6D). The average number of divisions undergone by NK cells (mean/SE: 2.55/0.01) was significantly higher than for CD8+ T cells (mean/SE: 1.12/0.18; p < 0.001), CD4+ T cells (mean/SE: 0.96/0.07; p < 0.001); p = 0.31) or CD45RO+CD4+ T cells (1.20/0.37; p = 0.005). Analysis of the proportion of the initial cell population that had gone through one or more divisions (12) confirmed that, after 7 d, all NK cells had divided at least once but only ∼30% of all CD45RO+ CD4+ T cells and <10% of CD8+ T cells or CD45RO− CD4 T cells had done so (Fig. 6D); however, the time to first cell division did not differ between NK cells and the CD4+ and CD8+ T cells (data not shown). Extensive NK cell proliferation during postvaccination recall response. Pre- and postvaccination PBMCs from four donors were labeled with CFSE, cultured for 7 d with rabies virus (07/162) and analyzed by flow cytometry. A, Representative flow cytometry plots of CFSE dilution (left plots) in postvaccination CD4+ T cells (upper plots), CD8+ T cells (middle plots), and NK cells (lower plots) after 7 d incubation with 07/162. Histogram overlays (right plots) compare CFSE dilution in postvaccination cells either ex vivo (dark fill) or after 7 d restimulation with 07/162 (light fill). B, Representative flow cytometry plots of CFSE dilution and CD45RO expression (left plots) after 7 d restimulation with rabies virus (07/162) in postvaccination CD4+ (upper plots) and CD8+ (lower plots) T cells. Histogram overlays (right plots) compare CFSE dilution in CD45RO+ (dark fill) or CD45RO− (no fill) CD4+ or CD8+ T cells. C, The percentage of CD4+ T cells, CD8+ T cells, or NK cells in the postvaccination, 7 d-restimulated PBMC population that had not divided, or had divided one or more times. Data represent mean + SE for four donors. D, Estimated proportions of the precursor populations of NK cells and CD45RO+ or CD45RO− T cells that did not divide, or that divided one or more times during the 7 d restimulation assay. Data represent means for four donors. To determine whether IL-2 alone is sufficient for NK cells to show a “recall” response to rabies virus after vaccination or whether other signals (e.g., from myeloid accessory cells) are also required for optimal NK cell responses we compared the recall response with structurally intact but heat-killed rabies virus (07/162) with that to purified rNCP and we investigated the effect on the NK cell recall response of adding or neutralizing IL-12 and IL-18 in the presence or absence of rIL-2 (Fig. 7). Suboptimal concentrations of rhIL-12, IL-18, and IL-2 that do not, alone or in combination, induce NK cell activation were determined by titration; for each cytokine a concentration of 0.01 ng/ml was selected. 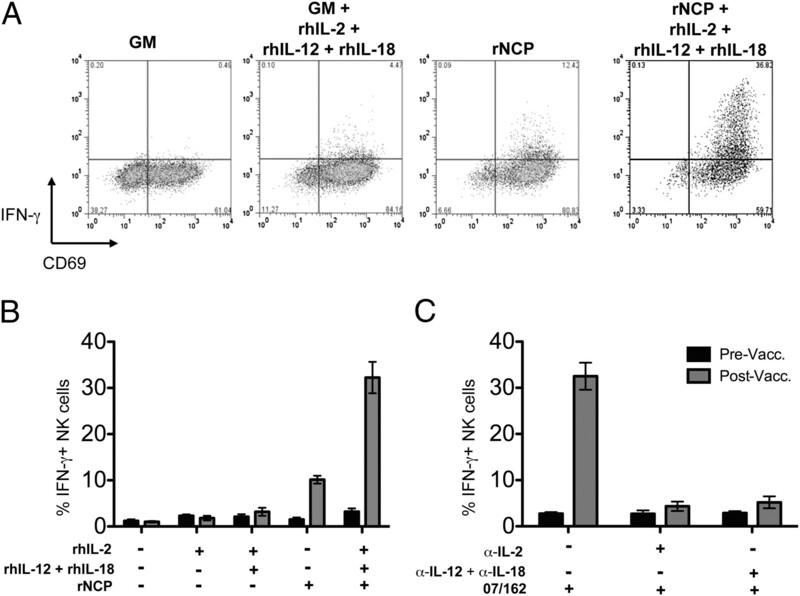 IL-12 and IL-18 synergize with IL-2 to activate NK cells after vaccination. Pre- and postvaccination PBMCs from five donors were restimulated in vitro with inactivated whole rabies virus (07/162) or with purified rNCP, in the presence or absence of recombinant human IL-2 or IL-12 plus IL-18, or in the presence or absence of neutralizing Abs to IL-2 or IL-12 plus IL-18, for 24 h and analyzed by flow cytometry for CD69 and IFN-γ expression. A, Representative flow cytometry plots showing IFN-γ production and CD69 expression in postvaccination NK cells cultured with or without rNCP in the presence or absence of rhIL-2, rhIL-12, and rhIL-18. B, Percentage of NK cells producing IFN-γ+ after restimulation with rNCP in the presence or absence of recombinant cytokines. Data represent mean ± SE of five subjects. The p values are derived from two-tailed paired Student t test. C, Percentage of NK cells producing IFN-γ+ after restimulation with rabies virus 07/162 in the presence or absence of neutralizing Abs to IL-2, IL-12, and IL-18. B and C, Data represent mean ± SE. NK cells among postvaccination PBMCs incubated with rNCP alone did not produce IFN-γ or upregulate CD69 (t = 2.1, df = 4, p = 0.6), but when cultured with rNCP plus 0.01ng/ml rhIL-12, rhIL-18, and rhIL-2 they responded strongly (t = 8.94, df = 4, p = 0.0009) (Fig. 7A, 7B). No NK cell response was seen in prevaccination PBMCs with any of the combinations of stimuli tested (Fig. 7B). Neutralizing Abs to IL-12 and IL-18 completely ablated the rabies virus 07/162-induced NK cell IFN-γ response in postvaccination PBMCs (t = 8.5, df = 4, p = 0.001) (Fig. 7C), in a very similar manner to IL-2 neutralization. We conclude that signals from two accessory cell populations (myeloid cells and T cells) are required for the recall response of NK cells and that inactivated virus but not rNCP (which presumably lacks the TLR-activating ligands present in whole virus) is able to induce a recall response in NK cells. Recent reports suggest that exposure to haptenated proteins, MCMV, or cytokines can enhance the subsequent response of murine NK cells to reactivation by the same stimuli, raising the possibility that NK cells can acquire a “memory” phenotype (14–16). To determine whether the enhanced antiviral response of postvaccination NK cells results from such an “adaptive” response to prior Ag exposure, we compared the 07/162-induced IFN-γ, CD69, and LAMP-1 responses of pre- and postvaccination PBMCs with the responses of prevaccination, CD3 T cell-depleted PBMCs to which purified postvaccination T cells had been added; as a control, CD3-depleted postvaccination PBMCs were mixed with purified prevaccination T cells (Fig. 8). We observed that prevaccination NK cells responded vigorously to inactivated rabies virus 07/162 when cultured together with postvaccination T cells and the magnitude of the NK response was proportional to the number of T cells added to the culture. Conversely CD3-depleted postvaccination NK cells cultured with naive T cells were fully responsive to high-dose IL-12/18 but were unable to respond to rabies virus. These data suggest that there are no intrinsic differences between prevaccination and postvaccination NK cells and that postvaccination NK cells are simply responding to the high levels of cytokines emanating from rabies virus-specific CD4+ T cells and myeloid accessory cells. Prevaccination NK cells respond to rabies virus 07/162 when cultured with postvaccination T cells. PBMCs, collected either before (white bars) or after (black bars) vaccination, were cultured without stimulus (GM) or with rhIL-12 and rhIL-18, or with 07/162, for 24 h and stained for intracellular IFN-γ (A); CD69 (B); and LAMP-1 (C). Responses of whole PBMCs were compared with those of CD3-depleted postvaccination PBMCs to which naive (prevaccination) T cells had been added (diagonally cross-hatched bars) and with those of CD3-depleted prevaccination PBMCs to which varying numbers of memory (postvaccination) T cells had been added (horizontally cross-hatched bars); postvaccination T cells were added to prevaccination PBMCs at ratios of 1 T cell per PBMC, or 1 T cell per 2, 5, or 10 PBMCs. The purpose of vaccination is to expand and differentiate small populations of naive, Ag-specific T and B lymphocytes into larger populations of memory cells with enhanced effector function, to accelerate the clearance of pathogenic microorganisms. Evaluation of vaccine-induced immune responses typically includes measurement of Ab titers and some assay of cell-mediated immunity, such as lymphocyte proliferation, cytokine secretion, or cytotoxicity. Although bulk assays (in which the responding cell type is not known) can now be supplemented by single-cell assays (such as flow cytometry, which allows both the number and phenotype of responding cells to be assessed), these assays are typically designed—and their outputs interpreted—on the assumption that differences in cell-mediated effector responses postvaccination, and especially after recall Ag stimulation of cells in vitro, are due solely to the actions of Ag-specific effector cells. Two recent examples, from otherwise groundbreaking studies, serve to illustrate the pervasiveness of these assumptions. In a study using functional genomics, polychromatic flow cytometry and systems biology to evaluate the global response to yellow fever vaccination, only the effector functions of CD4+ T cells were characterized at the single-cell level and IFN-γ secreted by PBMC cultures was assumed to be derived from Th1 cells, despite evidence that NK cells—a well-documented source of IFN-γ—were proliferating in the first 7 d after vaccination (17). A similar analysis of yellow fever vaccine-induced responses examined correlates only of CD8+ T cell and Ab responses (18). In this study, we compare, for the first time, pre- and postvaccination NK cell effector responses (IFN-γ production and exocytosis of cytotoxic granules), demonstrate that these responses are augmented in an Ag-specific manner by vaccination and demonstrate that NK cells contribute significantly to the postvaccination response, especially, but not exclusively, during the first hours and days after re-exposure to the vaccine Ag. Moreover, and again for the first time, we have elucidated the activation signals required for this postvaccination NK cell “recall” response. Our findings indicate that IL-2–mediated NK activation should be considered as an additional—and potentially very important—indicator of vaccine efficacy. In many ways, our findings are not surprising. 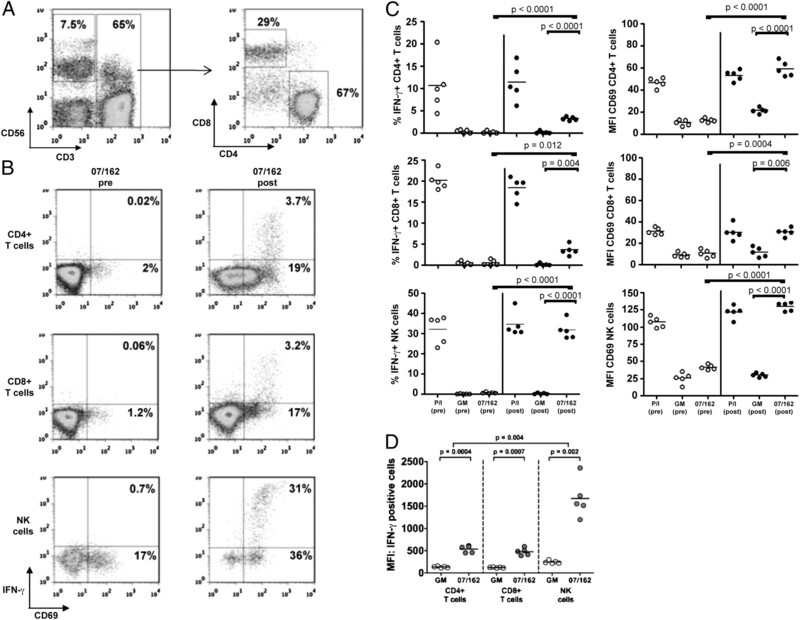 It has been known for several years that NK cells can represent a significant proportion of IFN-γ+ cells in the initial stages of a classical recall response (19), that IL-2 can augment NK cell responses (20, 21), that the NK cell response to influenza virus depends on IL-2 and T cells (9), and that increased numbers of IFN-γ–producing NK cells can be detected after influenza vaccination (10). However, the logical conclusion of these observations—that Ag-specific IL-2 secretion from memory T cells may recruit NK cells as effectors of adaptive immunity and, thus, that NK cell responses can be potentiated by vaccination—has not previously been made explicit and has not been formally tested. Indeed, our collective fixation on NK cells as cells that can mediate effector function without prior sensitization (22, 23) has blinded us to the notion that they may perform their effector functions even more effectively after sensitization. By detailed analysis of the response to rabies vaccination, we have shown that Ag-specific, CD45RO+ CD4+ T cells secrete IL-2 within 6 h of re-exposure to Ag and that this IL-2—in combination with IL-12 and IL-18 induced by the interaction of whole virus with other accessory cells—activates NK cells to produce IFN-γ and to degranulate, releasing perforin. A proposed schematic for the NK recall response is shown in Fig. 9. Importantly, these NK effector responses occur extremely rapidly, starting within 6 h (i.e., significantly earlier than the equivalent T cell responses), and are very robust, with 30–40% of all NK cells responding. Consequently, in the first 12–18 h after re-exposure to Ag, >70% of all IFN-γ–producing cells are NK cells. Importantly, however, NK cells also show a marked and prolonged proliferative response to the vaccine Ag and they continue to contribute to the effector cell population for at least 7 d after Ag re-exposure; indeed the secondary peak in the NK IFN-γ response may well represent maturation and activation of cells that have divided during the first few days of the response. Lastly, the recall NK cell response is extremely durable; we have repeated this analysis >4 mo after the last vaccination without any noticeable decline in the response (data not shown). Schematic representation of suggested pathway for “recall” NK cell responses. A, On first exposure, pathogens bind to macrophages/DC PRR (either on the cell surface or within various intracellular compartments) (I), leading to cytokine secretion, and upregulation of costimulatory molecules (II). Pathogen uptake and peptide presentation by DCs will prime naive T cells (III). However, in the absence of a source of IL-2, NK cells will not become activated. B, On re-exposure to the same pathogen, PRR binding, cytokine secretion, and peptide Ag presentation will again take place (I, II, III). In addition, IL-2 from primed effector T cells (IV) provides signals, which allow NK cells to secrete cytokines, become cytotoxic and proliferate. In the presence of ongoing Ag presentation, a second wave of activation may provide for a sustained NK cell response. The indirect route of NK cell activation has largely been overlooked until recently but it is now clear that inflammatory cytokines (IL-12, IL-18, and IFN-α) and costimulatory signals from myeloid accessory cells are essential for optimal NK cell responsiveness to a wide range of viral, bacterial, and protozoal infections (5). 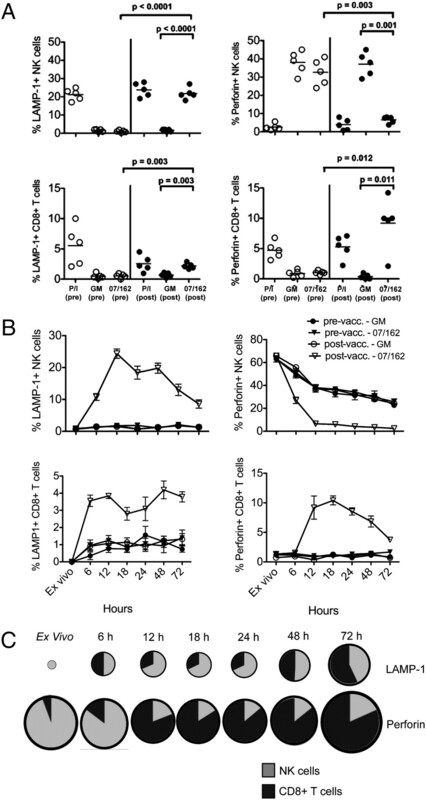 Our finding that intact rabies virus, but not purified recombinant protein, was able to activate NK cells after vaccination in an IL-12– and IL-18–dependent manner, is consistent with a requirement for myeloid accessory cell-derived as well as T cell-derived signals for induction of recall NK responses. Neither the rabies virus encoded ligands for pattern recognition receptors (PRRs) nor the PRRs themselves are known. Although TLR3 is upregulated in brains of rabies virus-infected mice (24, 25) and humans (26), TLR3 preferentially recognizes dsRNA rather than ssRNA and is thus not an obvious candidate for recognition of rabies virus. Human TLR8/murine TLR7s are receptors for some ssRNAs (27, 28) and may thus be more likely innate receptors for rabies virus. One practical implication of the need for myeloid acessory cell stimuli for induction of recall NK responses is that evaluation of vaccine-induced immune responses by restimulation of PBMCs with purified protein Ags or synthetic peptides may not reveal the full extent of the NK recall response that may occur after exposure to whole pathogens. It is likely that NK recall responses will be further enhanced, after vaccination, by the presence of specific Ab; Ag–Ab complexes binding to CD16 are a powerful route for NK cell activation and in preliminary experiments we have observed that rabies virus restimulation of postvaccination PBMCs in the presence of autologous serum (i.e., containing anti-rabies Abs) leads to even more florid NK cell responses than the ones shown here. Our finding that, in the absence of T cells, rIL-2 is sufficient to restore NK recall responses indicates that IL-2 is the only T cell-derived signal that is essential for the NK recall response. In support of this scenario, we have shown that although T cells are required for optimal activation of NK cells by malaria-infected RBCs, there is no requirement for NK cell–T cell contact and that the T cell-dependent signal can be delivered to the NK cells via a semipermeable membrane (29). Our data therefore reveal an important new role for vaccine-induced IL-2–secreting memory T cells and may, in part, explain the emerging consensus that polyfunctional T cells, which secrete IL-2 in addition to IFN-γ or TNF-α, are associated with positive outcomes of viral infection (30–32) and with particularly effective vaccination regimes (33, 34). It was noticeable that whichever parameter we assayed (CD69 upregulation, IFN-γ production, degranulation), the NK cell response to rabies vaccination among the vaccinees was remarkably homogeneous. Overall, for different parts of the study, we assayed responses from 30 individuals and in every case there was a robust and persistent NK cell recall response. This is in marked contrast to our previous findings for NK cell responses to malaria-infected RBCs, Mycobacterium bovis bacillus Calmette-Guérin and bacterial LPS where NK IFN-γ responses are extremely heterogeneous, but similar (in homogeneity, if not magnitude) to responses we observed to high-dose rhIL-12+IL-18 (35). We have proposed that heterogeneity in NK cell IFN-γ responses to pathogens reflects both differences in the strength of accessory stimuli and variable expression of polymorphic NK cell receptors (which fine-tune the degree of activation) (35). The results of this vaccination study suggest that if the accessory cell stimulus is sufficiently strong (which may require synergism of signals from myeloid cells and T cells) then the effect of NK cell regulatory receptors may be overcome. If so, genetic diversity in NK cell regulatory receptors may not represent a major hurdle to effective vaccination. Although there are superficial similarities between the “recall” NK response that we have described and the “memory-like” NK cells recently described in mice (14–16), there are important differences between the cytokine-driven response described in this study and some of the mouse studies. In mice infected with murine CMV (MCMV), NK cells proliferate, persist at higher than normal frequencies for several months and show enhanced cytokine and degranulation responses on reactivation (16); however, NK cell activation in this model is driven by binding of the activating NK Ly49H receptor to the m157 viral protein expressed on MCMV-infected cells (36) and may thus occur independently of accessory cell stimuli. Indeed, expansion of the Ly49H+ NK cell subset in MCMV+ mice is reminiscent of the expanded population of NKG2C+ NK cells in individuals seropositive for human CMV (37). Similarly, the original description of murine memory-like NK cells, in a contact hypersensitivity model, specifically involved Ly49C+/Ly49I+ cells, which might conceivably be activated by haptenated MHC class I molecules and, at least inasmuch as T cells were not required, would appear to be IL-2 independent (15). Importantly, the “memory” component of the postvaccination NK response to rabies virus described in this study appears to lie entirely within the T cell population: NK cells from unvaccinated individuals were fully able to respond to the virus when mixed with autologous memory T cells. It is not known whether nonspecific inflammatory stimuli can maintain human NK cells in a prolonged hyper-reactive state, as recently described for murine NK cells activated in vitro with a mixture of accessory cell-derived cytokines (14), but this might be interesting to explore in the context of vaccine adjuvants. Our study raises interesting questions regarding the functional significance of enhanced NK cell responses after immunization. For infections where a protective role for NK cells is established, evaluation of NK responses postvaccination is likely to be a useful indicator of vaccine efficacy but for other infections the implications are less clear and further studies are required. In the case of rabies virus vaccination, it is widely accepted that neutralizing Abs are essential for protection (38) but experimental infections in mice suggest that cell-mediated immune responses (including signaling through the IFN-γR) are required for efficient viral clearance (39) and that proinflammatory cytokines (IFN-γ and IL-2) enhance vaccine immunogenicity, leading to significantly higher neutralizing Ab titers (40). The potential for NK cell IFN-γ responses to contribute to the efficacy of rabies vaccines thus deserves to be evaluated. The role of the degranulation response is less obvious. In these particular experiments, using killed virus, it is unlikely that NK cells are degranulating in response to infected cells and degranulation may simply be a marker of NK cell activation. In summary, we have demonstrated that NK cells are major contributors to the effector lymphocyte population during the recall response to rabies vaccination. This should lead us to reconsider the precise roles of Ag-specific memory T cells in vaccine-induced immunity. Assays of CD4+ T cell IL-2 production, NK cell IFN-γ production and NK cytotoxicity need to be included in the arsenal of tools for evaluating correlates of vaccine-induced immunity. We thank Carolynne Stanley for subject recruitment and sampling, Patrick Corran for statistical advice, and Karoline Schjetne (Invitrogen) and Dr. M. Juozapaitis (Institute of Biotechnology, Vilnius, Lithuania) for donation of essential reagents. Disclosures The authors have no finacial conflicts of interest. This work was supported by the United Kingdom Medical Research Council (Grant GO 400225) and the University College London Hospitals’ Comprehensive Biomedical Research Centre. recombinant rabies virus nucleocapsid protein.
. 2005. Targeting the innate immune response with improved vaccine adjuvants. Nat. Med. 11(4, Suppl)S63–S68. 2000. Immunological concepts of vaccine adjuvant activity. Curr. Opin. Immunol. 12: 456–463.
. 2004. The interface between innate and adaptive immunity. Nat. Immunol. 5: 971–974.
. 2007. Whatever turns you on: accessory-cell-dependent activation of NK cells by pathogens. Nat. Rev. Immunol. 7: 279–291.
. 2007. Dissection of the role of PfEMP1 and ICAM-1 in the sensing of Plasmodium-falciparum-infected erythrocytes by natural killer cells. PLoS ONE 2: e228.
. 2006. Cross-talk with myeloid accessory cells regulates human natural killer cell interferon-gamma responses to malaria. PLoS Pathog. 2: e118.
. 2004. T cell-dependent production of IFN-gamma by NK cells in response to influenza A virus. J. Clin. Invest. 114: 1812–1819.
. 2008. Elevated frequency of gamma interferon-producing NK cells in healthy adults vaccinated against influenza virus. Clin. Vaccine Immunol. 15: 120–130.
. 2005. Heterogeneous human NK cell responses to Plasmodium falciparum-infected erythrocytes. J. Immunol. 175: 7466–7473.
. 2007. Measuring lymphocyte proliferation, survival and differentiation using CFSE time-series data. Nat. Protoc. 2: 2057–2067.
. 2009. Cell death mechanisms induced by cytotoxic lymphocytes. Cell. Mol. Immunol. 6: 15–25.
. 2005. The duration of in vitro stimulation with recall antigens determines the subset distribution of interferon-gamma-producing lymphoid cells: a kinetic analysis using the Interferon-gamma Secretion Assay. J. Immunol. Methods 301: 124–139. 2008. The biology of interleukin-2. Annu. Rev. Immunol. 26: 453–479.
. 2009. Natural killer cell-based immunotherapy in cancer: current insights and future prospects. J. Intern. Med. 266: 154–181.
. 2002. What is a natural killer cell? Nat. Immunol. 3: 6–8.
. 2008. Up-regulation of chemokine gene transcripts and T-cell infiltration into the central nervous system and dorsal root ganglia are characteristics of experimental European bat lyssavirus type 2 infection of mice. J. Neurovirol. 14: 218–228.
. 2005. Viruses selectively upregulate Toll-like receptors in the central nervous system. Biochem. Biophys. Res. Commun. 336: 925–933.
. 2006. Expression of Toll-like receptor 3 in the human cerebellar cortex in rabies, herpes simplex encephalitis, and other neurological diseases. J. Neurovirol. 12: 229–234.
. 2010. Cross-talk between T cells and NK cells generates rapid effector responses to Plasmodium falciparum-infected erythrocytes. J. Immunol. 184: 6043–6052.
. 2008. Polyfunctional HCV-specific T-cell responses are associated with effective control of HCV replication. Eur. J. Immunol. 38: 2665–2677.
. 2009. Mucosal immune responses to HIV-1 in elite controllers: a potential correlate of immune control. Blood 113: 3978–3989.
. 2008. Polyfunctional cytomegalovirus-specific CD4+ and pp65 CD8+ T cells protect against high-level replication after liver transplantation. Am. J. Transplant. 8: 2590–2599.
. 2009. Protection and polyfunctional T cells induced by Ag85B-TB10.4/IC31 against Mycobacterium tuberculosis is highly dependent on the antigen dose. PLoS One 4: e5930.
. 2006. Functional signatures of protective antiviral T-cell immunity in human virus infections. Immunol. Rev. 211: 236–254.
. 2009. Killer Ig-like receptor (KIR) genotype predicts the capacity of human KIR-positive CD56dim NK cells to respond to pathogen-associated signals. J. Immunol. 182: 6426–6434.
. 2010. The immune response to rabies virus infection and vaccination. Vaccine 28: 3896–3901.
. 1998. Collaboration of antibody and inflammation in clearance of rabies virus from the central nervous system. J. Virol. 72: 3711–3719.
. 1998. Antigen detection in vivo after immunization with different presentation forms of rabies virus antigen, II. Cellular, but not humoral, systemic immune responses against rabies virus immune-stimulating complexes are macrophage dependent. Immunology 94: 455–460.